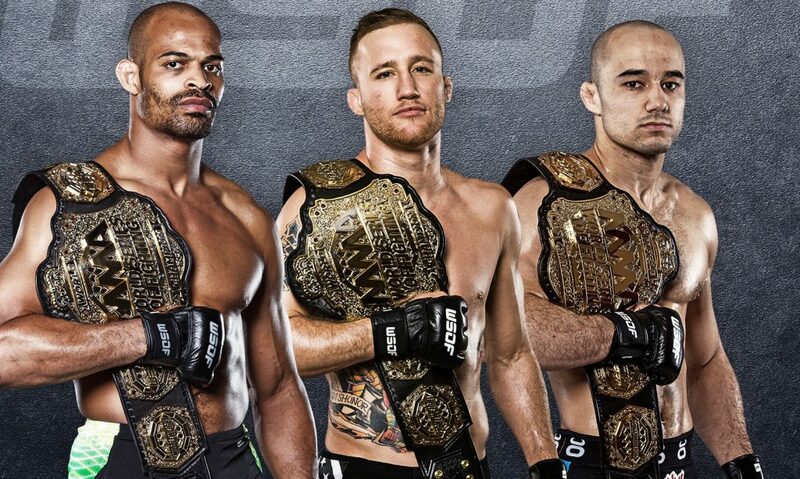 LAS VEGAS (June 29, 2015) –World Series of Fighting (WSOF.com) announced today that it has re-signed three of its decorated, reigning world champions – middleweight (185 pounds) kingpin David Branch, undefeated lightweight (155 pounds) champion Justin “The Highlight” Gaethje and bantamweight (135 pounds) titleholder Marlon Moraes – to new, exclusive, multi-year agreements. “We are thrilled to have these three incredible champions on board with WSOF for the long haul again,” said WSOF President Ray Sefo. “Justin and Marlon are both homegrown superstars that we have been building since we opened the doors at WSOF, while David, who came to us as an established star, has grown into an even more dynamic and dominant mixed martial artist since joining the WSOF roster. The 33-year-old Branch (16-3) of Brooklyn, N.Y. is in the midst of a spectacular, six-fight win streak that he has put together with wins over the likes of Dustin Jacoby, Paulo Filho, Jesse Taylor and Yushin Okami. A student of MMA legend Renzo Gracie, Branch, who has finished over 60 percent of his opponents during his 8 year professional career, notched his latest win, a second round (1:28) technical submission (shoulder choke) win over Jesse McElligott, on April 10 at WSOF 20. Gaethje (14-0), a 26-year-old phenom who hails from Safford, Ariz., is coming off a March 28 conquest of seasoned battler Luis Palomino that served as the main event at WSOF 19. Before a hometown crowd, Gaethje, who has earned 11 of his 14 career wins by way of (T)KO, engaged in an all-out slugfest, for nearly three full rounds before finally scoring a TKO victory with an onslaught of leg kicks and punches that downed Palomino at the 3:57 mark of the third stanza. Moraes (14-4-1) of Howell, N.J. via Nova Friburgo, Rio de Janeiro, Brazil, will put his 9-fight win streak on the line, in his second WSOF title defense, when the 27-year-old faces undefeated star Sheymon Moraes at the star-studded “WSOF 22: Palhares vs. Shields” event, live on NBCSN from Planet Hollywood Resort Casino on Sat., Aug. 1. Branch, Gaethje and Moraes will all be featured on “WSOF Unstoppable: The Road Ahead” on NBC on Saturday, July 11, beginning at 4 p.m. ET/1 p.m. PT. The special, two-hour program, co-hosted by retired MMA icon Bas Rutten, NBCSN veteran announcer Todd Harris and Gracie, will include interviews with all three WSOF world champions as well as their respective, recent championship bouts.